The St. Mary’s University School of Law has increased the number of Summer Public Interest Fellowships available to law students to encourage a future generation of lawyers committed to public interest careers. With the help of a grant from the University to the School of Law’s Office of Career Services, the number of students participating in Public Interest Fellowships this summer increased from one to five. There is an overwhelming demand for legal aid services and the fellowships aim to help meet that need by encouraging students to pursue public interest legal careers, said Robin Thorner, J.D., Director of Career Services for the School of Law. The fellowship provides a stipend of up to $5,000 to students taking a voluntary legal position, without which students might not be able to afford to relocate for a summer position. 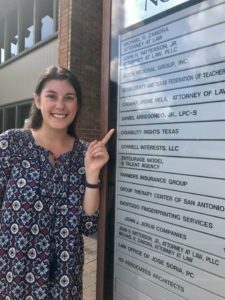 It also enables the School of Law’s Office of Career Services to develop stronger working relationships with nonprofit legal organizations throughout Texas, which can lead to post-graduate opportunities. This year’s fellowship recipients said the financial assistance gave them the ability to learn the law while giving back. Law student Mark Garza said the fellowship award “has removed a huge burden” and enabled him to work at the organization Aid to Victims of Domestic Abuse. Those interested in helping create fellowships for students interested in public interest and public service can donate to the Summer Public Interest Fellowship Fund, which was launched with contributions from the law school’s GOLD (Graduates of the Last Decade) Council members and other recent law alumni.